Any wall measurements might have some variations depending on the accuracy when taking the image as well as inserting the measurements. Please note that the Wall Measurement tool does not replace highly accurate measurement systems on-site. Any critical measurements should be double-checked for their accuracy. 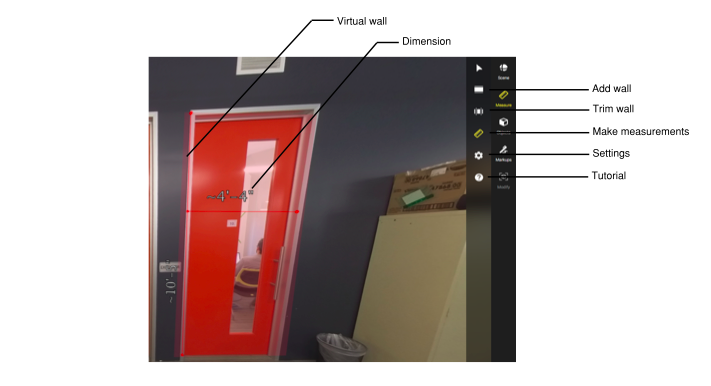 Wall Measurement is an integrated tool for adding realistic measurements of, e.g., walls, window or doors in your 360° scene to display relevant information on proportions and virtual layouts directly in a 360° scene. It is possible to do these wall measurements from a single photo if the height of the camera lens above the floor is known. Always make sure you know the height of the camera (lens) on your tripod when taking the 360° images. According to the defined image height, we can calculate the measures of any marked objects in a 360° scene. To work with Wall Measurement, it is important to capture each image at an equal height (distance from the camera lens to the floor). With this given height, HoloBuilder then enables you to accurately measure parts of your virtual 360° scene. As for now, it is best to set the height of the lens to approximately 63 inches (160cm). But, you can also choose any other height and change the settings in HoloBuilder accordingly. It is very important that you set the camera lens to the height you want to use and not only the tripod, e.g., with the Theta S still having about 2.8 inches (7cm) extra from the bottom to the lens, the measuring would become inaccurate. The more accurate the height of the lens, the better the measuring results will be when editing the scene. Wall Measurement can also be used in combination with the JobWalk app. Simply make sure to set the tripod height to the desired level when creating the tour with the JobWalk app. Furthermore, it is possible to edit added Time Travel scenes with Wall Measurement. Click the “Measurements” button with the ruler icon in the right-hand sidebar to open the Wall Measurement menu. Set the height (distance from the camera lens to the floor) your image has been taken at in inches or cm. 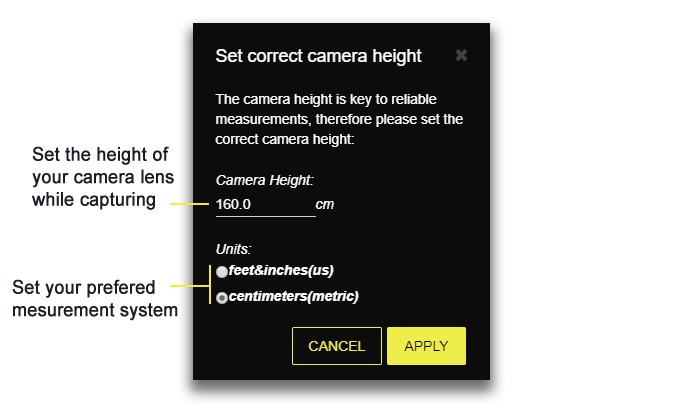 It is possible to adjust the defined height of your camera lens or the measuring unit in the Wall Measurement settings. To start your measurements in the scene, you first need to select the area or ‘wall’ you want to make the measurements in. When first opening the Wall Measurement menu, the correct tool for creating a virtual wall first will automatically be selected. If not, click the wall icon in the Wall Measurement menu. 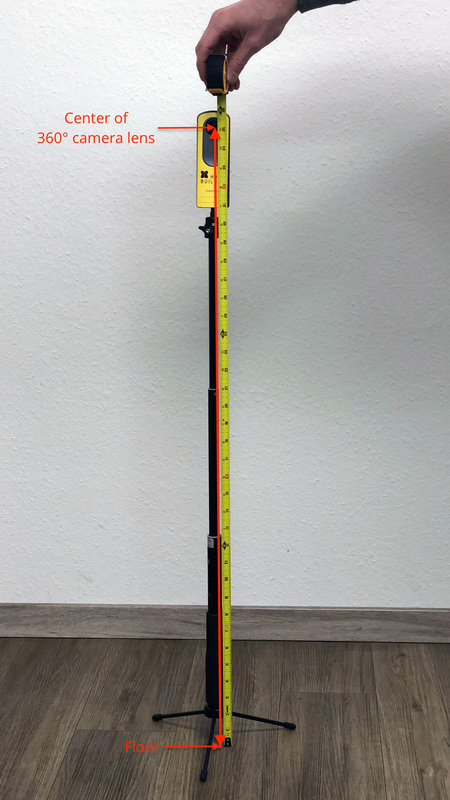 Select one point in your 360° image (an intersection point between the floor and a wall) by clicking (if the Wall Measurement tool is selected). Next, you need to set the height and orientation of the whole area. Either click first on a horizontally aligned point intersecting with the floor and then set the height by choosing a vertically aligned intersection point with the ceiling, marking a kind of four-sided figure, or vice versa.